NEWCASTLE UPON TYNE, UK – 2006 will go down as the year the British mass media ‘discovered’ the bicycle. In June there were many high-profile media mentions of cycling, including a full front cover on newspaper ‘The Independent’, followed by a week of dedicated cycling articles and a 24-page supplement. This sort of coverage was as surprising to the British bicycle trade as it was welcome. And thanks to The Independent’s lead, many other newspapers, and lots of TV programmes, followed up on what The Independent headlined as a ‘Revolution’. 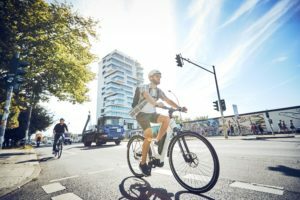 The newspaper said Britain was experiencing a bicycling boom: "Britain is in the grip of a cycling revolution as clogged roads, concern at global warming caused by air pollution and the quest for improved fitness persuade millions to opt for pedal power." In London, trips by bike had increased by 50% in five years to 450,000 per day. And there had been a 15% increase in journeys on the National Cycle Network, a rise to 232 million journeys. In the previous year the rise was 11%. The Guardian newspaper now has a cycling columnist – Matt Seaton – and he said the mass media mentions about cycling were because: "Cycling is moving centre stage and we need to adapt to the new circumstances." Another Guardian columnist made a high-profile conversion to cycling in late December. Polly Toynbee, a well-known figure in the UK, said her two children had bought her a bicycle for Christmas and she ‘loved’ it. She said she will now campaign for more cycle routes in the UK because she has now discovered that cycling is so ‘fantastic’. Toynbee’s columns get noticed. Late in 2006 Greg Clark, advisor to Tory leader Cameron adviser, suggested that Toynbee might have more ideas to offer the Tories on social policy than Sir Winston Churchill, an issue that was plastered all over the media. Now that Toynbee has seen the light on her personal cycle-path to Damascus it’s probable she will be authoring many pro-pedaling polemics in 2007. The mass media may have put a positive spin on cycling but there was little evidence on the ground that the bike market was booming. In fact, there were many high-profile business closures and financial losses in 2006 and a further net loss of IBDs. 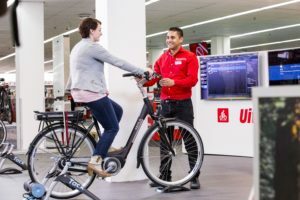 However, the bigger IBD chains – such as Evans Cycles and Edinburgh Bicycle – and multiples such as Halfords continued to profit from cycling, accelerating the concentration of bike sales through fewer and fewer outlets. Well-known IBDs such as Bonthrone’s of London went to the wall but the bigger IBD chains continued expanding. Evans Cycles and Edinburgh Bicycle have now carved out positions in the south and north of the UK respectively and, following store openings, are now competing head-to-head in the Manchester-to-Leeds catchment area. The bigger online retailers are also forging ahead, gaining ground on smaller, underfunded rivals. In July, Wiggle.co.uk was refinanced by the new co-owners of Fisher Outdoor. ISIS Equity Partners led a GBP 12.25 million (€ 18.28 mn) refinancing of the online retailer founded in 1999 by a Portsmouth bike shop. In three years Wiggle increased its turnover from GBP 2.7 million (€ 4.0 mn) to GBP 11.8 million (€ 17.60 mn). In order to combat the threat from online powerhouse retailers such as Wiggle, ChainReaction and others, some IBDs are grouping together or forging closer allegiances to single suppliers. In 2006 Raleigh reinflated its Cyclelife retail franchising package for IBDs and at the Giant dealer conference IBDs signed up for the new Giant In Store programme but Giant MD Ian Beasant stressed the programme wasn’t a franchise nor would it take over an IBD’s whole shop ("unless that’s what you want.") Raleigh’s retail development manager Paul Wignall said: "There are currently 54 Cyclelife members across the UK, that are either fully trading as Cyclelife stores or who are in the process of conversion, with a further 34 prospects. Our target is to have 100+ dealers by spring 2007, with an ultimate objective to 250+ dealers nationwide." Being tied-in tight to one supplier could be a major trend for 2007. In October 2006 the UK got its first Specialized concept store, an idea imported from the US. Bike Factory of Chester opened a standalone Specialized store next to its current premises. The store is run and managed separately from Bike Factory. The one-brand bike store concept is popular in America. Bike Factory has been a Specialized stockist for 20+ years. The store covers 3,500sq feet on two floors and uses the same designs and fixtures as the recently opened stores in the USA. Specialized bicycles and equipment are sold exclusively but other products and brands such as locks or lighting can be sold alongside the Specialized range. Other one-brand stores are set to open in 2007. But it’s IBD brands made the biggest waves in 2006. Evans Cycles and Edinburgh Bicycle continued to dominate the UK scene with surprise openings away from their core areas of South East England and Scotland respectively. Edinburgh Bicycle opened a store in Leeds in April and, late in 2006, announced it was to also make a move on Manchester. The Edinburgh Bicycle Cooperative store will be the "biggest [bike shop] in the city", said EBC’s promotions manager Kate Webster. In December 2004, Evan Cycles had opened a store in Castleford, close to Leeds. The two superpower IBDs are now fighting head to head in northern England, and smaller, long-standing northern IBDs are feeling the pinch. North of the border, Alpine Bikes, the Aberdeen-based IBD chain with five stores in Scotland, was bought by the Tiso Group, an independent outdoor retail chain based in Scotland. Two Alpine Bikes stores are already sited within Tiso Outdoor Experience stores. Chris Tiso, CEO of the Tiso group, said: "The cycle industry is a key growth market sector." Halfords had a storming 2006, adding stores, revamping its Bikehut retail concept and had a good summer: in a trading update for the 26 weeks to 29th September Halfords said sales and revenue increased by 9.3% over the equivalent period in 2005 to GBP 369.2 million (€ 550.9 mn). Operating profit increased by 5.7% to GBP 48.5 million (€ 72.4 mn). Now with 420 stores, Halfords had opened 13 new stores over the summer and by the Autumn had opened the first of the new-look standalone Bikehut stores, the first of which was the Brighton store, opened on November 9th. This was a relaunch of the standalone concept: Halfords was planning to roll out the concept in 2003 following a trial at a standalone Bikehut store in Havant. Halfords has plans for three or more standalone Bikehut’s due to open in the first few months of 2007. Also in 2006 Halfords was the dominant factor in the UK bike market with a market share of over 30%. In April the Bicycle Association of Great Britain announced it is to become a whole lot more liquid as it was to sell its 50% stake in its HQ, Starley House in Coventry. Jointly owned by the Bicycle Association and Motor Cycle Industry Association, Starley House was to be sold to a property developer and, later in 2007, is to be demolished to make way for a retail development. The BAGB will receive GBP 880,000 (€ 1.31 mn). This was a: "Remarkable opportunity for a revitalisation of the association for today’s world," said Phillip Darnton, the BAGB president. "This sale of the property is absolutely not the winding-down or dismembering or the end of the BA: quite the opposite. The sale provides us with the opportunity to create financial security for the BA after almost 10 years of struggling to match income to our overhead costs. Making ends meet without the historic benefit of an income from cycle shows, has been difficult, and subscriptions have had to remain high, on top of which we expected additional contributions in setting up the Bike Hub scheme. "With a prudent investment programme for our capital we will have a secure income for the long term. We have the opportunity to reduce our overhead, lower subscriptions and actively promote the BA to potential new members. There will be a membership drive in 2007 once we are clear on the basis for the new Bicycle Association." 2006 was a bumper year for bicycles in Britain’s capital. 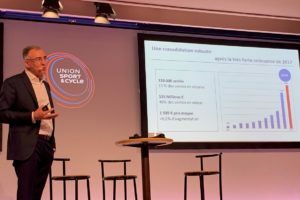 Cycle usage soared as the congestion charge was increased from GBP 5 (€ 7.46) to GBP 8 (€ 11.93) and the London mayor Ken Livingstone announced initiative after initiative to increase cycle usage even further. He’s not a cyclist – he prefers buses and the London underground – but Livingstone has done more for British cycling than perhaps any other authority figure in the last 120 years. He made it a top priority to entice the Tour de France to London in 2007 and he said this was to boost tourism in the capital but also to raise the profile of cycling even higher. In February 2006, announcing London’s success at gaining the Grand Départ, Livingstone said: "Hosting the first stage of the legendary French cycle race will raise the profile of cycling in the capital, attract visitors and promote the capital as a venue for international sporting events. There was no change in the overall number of new PTWs registered in the UK in 2006 compared to 2005; the rate of decline in moped sales has slowed and motorcycle sales made up for their fall overall. Sales of PTWs from mainland China almost doubled, with every sign that the Chinese invasion will continue apace. Sales of mopeds, scooters and small motorcycles from China have almost doubled to 18,324 in 2006 – more than one machine in seven – and that is just the street-legal powered two-wheelers registered for the road; hundreds of thousands of ‘off-road only’ mini-bikes, motorised skateboards and dirt bikes have poured into the UK over the last couple of years, along with a lot of Chinese quads and buggies, both road legal and ‘off road only’. 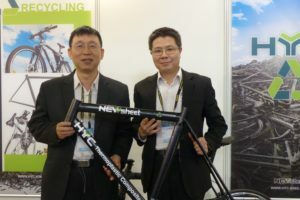 At this month’s Trade Expo (Jan 14-16) there were no less than eleven companies selling road-legal Chinese motorcycles and scooters to the UK trade and nine more selling quads, buggies and non road-legal dirt and mini bikes. At least four more companies are currently advertising Chinese bikes and scoots to the general public via newspapers and magazines. Prices, even for 125cc bikes, start from as little as GBP 375 (€ 560). Since there are almost no mainland Chinese machines imported bigger than 125cc, it follows that their presence is being felt most in the learner-legal categories, particularly within the Scooter, Naked, Custom and Trail/Enduro sectors. They accounted for a third of all new mopeds registered in 2006, up from one in five in 2005. In fact the October year-to-date statistics showed the Baotian BT50 QT9 as best-selling moped scooter – the first time a Chinese machine has topped the ‘leaderboard’ in any category. It was overtaken by Piaggio’s cheap Zip in November, which remained best seller in December (it’s cheap thanks to lots of Chinese components). Peugeots long-lived (and soon-to-be-made-in China) Speedfight 50 rose to second above last year’s top-selling 50, the Piaggio NRG. Baotian-labeld machines were the most popular Chinese brand in the UK, with 2,574 newly registered in 2006 and as the MCI pointed out, ‘this does not include other brands that may have been sourced from the same factory’. Amongst non-scooter mopeds the Chinese Kinroad XT50 Q was second only to the popular Aprilia RS50 sportster, while in 5th place the stylish CPI SM50 became the first model from this Austro-Taiwanese brand to make an appearance in the UK ‘charts’. However, non-scooter mopeds had the biggest drop in sales, 14% down. 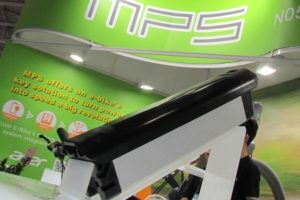 Whereas sales of moped scooters in 2006 fell by 4%, those of non-moped scooters rose by the same amount, roughly balancing the overall figures, since each type accounts for roughly 20,000 machines. This makes a pleasant change from last year when non-moped scooter registrations fell by 15% and scooters of all types still make up 30% of UK sales. Honda’s cheap and cheerful Indian-built SCV 100 Lead and big-wheeled Dylan 125 once again topped the learner-legal scooter charts, but each has sold hundreds of units less than last year. Piaggio’s Vespa GTS 250 continued to dominate the over-125 scooters, selling more units (722) than the next four models put together. Suzuki’s AN400 Burgman is once again the best-selling over-350cc scooter, helped as ever by its sub-25Kw new-rider-legal status. Yamaha UK actually sold out of Tmax 500s at the end of the year, selling 30% more than in 2005, although that still only amounted to a paltry 124 machines, just ahead of Honda’s Silver Wing 600 (124). Surprisingly, sales of Piaggio’s top of the range X9 500 continue to fall, down to a miserable 57 units in ’05 outsold even by Suzuki’s hugely expensive Burgman 650 (88). Piaggio’s sporty Gilera Nexus 500 didn’t even make the top 5. Sales of custom-styled machines grew by 21% in 2006 (from 9,131 to 11.020) and here too, the Chinese have made their mark. However, sales of Suzuki’s GZ125 more than doubled to 1047, taking it from third to first, and outselling all types of Harley Davidson. But while Harleys had three of the top five sellers, the only other 125cc machine was the Jinlun JL 125 in third place, with an impressive 564 sold, making it the best selling Chinese motorcycle in the UK, by far. The British bikers’ love of supersports machines over all other types of motorcycle continued in 2006, albeit with a 5% drop in registrations compared with 2005 (down from 25,458 to 24,134). While Honda retained top slot, not only in this class, but with the best selling model over everything else, it was with a completely different machine from last year: the fire-breathing CBR1000 RR Fireblade (2067). In contrast to the super-sportsters, the Sport/Touring segment grew by an encouraging 11% – the only one to show significant growth apart from Customs. However, the sportier style of machine still sells in much greater numbers in the UK (24,134 SSs vs 10,773 STs). Suzuki’s SV650 remained the most popular Sports Tourer. Honda’s NT700V–is a new variation on a faithful old V-twin theme but the 767 machines registered was enough to make it the top selling tourer in 2006. The Trail/Enduro segment showed the biggest fall in registrations of all the motorcycle categories, down 10%. This came as no surprise since the despised and grossly unjust Natural Environment and Rural Communities (NERC) Act came into effect in 2006, making it illegal to ride a huge proportion of the ‘green lanes’ of England and Wales. In fact if it hadn’t been for the popularity of cheap Chinese trail bikes, registrations in this sector would have fallen much more. Honda’s XLR 125 remained the most popular machine (873) far ahead of Suzuki’s fat-tyred fun bike, the Van Van (361) but the Chinese Urban DZ125 (314) and Lifan LF 125 (313) jumped into third and fourth place. The Adventure Sport class is completely dominated by BMW’s all-conquering R1200GS (1468), and its new stablemate, the R1200GSA (809), just as it was previously dominated by the two R1150GS models. Second hand PTW sales continue to outnumber new machine sales three to one, although the MCI estimates that these are down 2% to 462,000 from 472,000 in 2005. Putting a positive spin on the end of year statistics, Craig Carey-Clinch, the MCI’s Director of Public Affairs said, “This still means that in 2006 over 600,000 new and used motorcycles changed hands, indicating that the overall motorcycle market in the UK remains vibrant as interest in this polluting and congestion-busting mode of transport continues to be sustained. Traditional motorcycle dealers certainly need to heed that advice as cheap new Chinese machines flood in by the container-full and increasing numbers of second hand machines are sold privately on ebay and elsewhere. There could be tough times ahead for many if they don’t move with the times.